Beginning of Coins in the U.S. In 1792, American Congress passed the country’s first coinage act. This meant that the United States Mint was officially responsible for creating coins for public use. Thomas Jefferson and Benjamin Franklin were two of the men who contributed research and ideas towards the early versions of the coins. 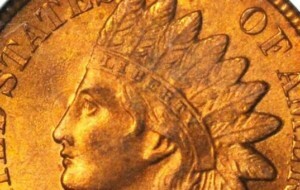 The Treasury Seal that was developed actually remained quite the same even until today. The Mint’s coin production process has advanced greatly since 1792. The first Philadelphia Mint used harnessed horses to drive the crude machinery that produced our coinage. The manual process required heating metals in a blacksmith-like furnace, and flattening them into sheets by repeated trips through rollers. Coin shapes were then punched out of the metal sheets, and these were hand-fed into machines that stamped them with coin faces. The coin making process was a physical and tedious one and imperfect coins were frequent. Today, the Philadelphia and Denver Mints—which employ a highly-automated version of the same steps used in 1792—often produce millions of coins for circulation in 24 hours. The modern Philadelphia and Denver facilities together in recent years have produced as many as 28 billion coins in a single year. In 1801, the United States began producing large silver peace medals for presentation to American Indian chiefs and warriors, following a diplomatic tradition set by the France and Great Britain. Lewis and Clark carried them on their expedition and presented them as tokens of peace from President Jefferson himself. Presented at treaty signings, the medals carried the face of the current president, with symbols of peace and friendship on the reverse. The Mint was authorized to manufacture coins for foreign governments in 1874 (Act of January 29, 1874), as long as the function did not interfere with coinage production for the United States. The first foreign coins were struck at the Philadelphia Mint for the government of Venezuela: two million 2 ½ centavo and ten million 1 centavo denominations from 1875–1876. From that time through the early 1980’s, foreign coins were struck for more than forty governments—including Hawaii (1883–1884) before it became the 50th State of the Union in 1959. The Mint also once produced military decorations for the nation’s armed forces, including the Silver Star, Bronze Star, Purple Heart, and the Navy Cross. Note: This list does not include regular issue gold coins. 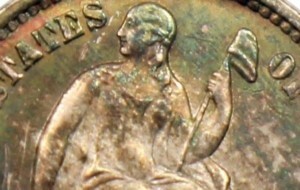 In the Act of 1792, Congress mandated that all American coins show on one side “an impression emblematic of Liberty, with an inscription of the word Liberty, and the year of coinage; and upon the reverse of each of the gold and silver coins shall be the representation of an eagle, with this inscription, ‘UNITED STATES OF AMERICA’. . . “. 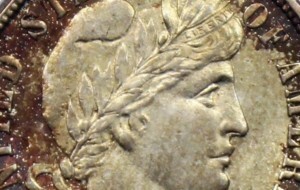 Many changes in coin designs have been made since 1792; however, much of the original design scheme remains. All U.S. coinage is produced with what is commonly called a “coin turn.” That means that the reverse side (tails) of the coin is upside down to the obverse side (heads). While Mint historians have researched the history of this practice, they have been unable to determine the exact reason for this custom. The Mint still produces U.S. coinage in this manner for traditional reasons, and not due to any legal requirement. The Lincoln cent is the only circulating coin currently produced in which the portrait faces to the right. The likeness of President Lincoln is an adaption of a plaque by Victor David Brenner, an outstanding portraitist and sculptor. President Theodore Roosevelt was so impressed with Mr. Brenner’s design that he recommended to the Secretary of the Treasury that the design be placed on a coin issued in the Lincoln Centennial Year, 1909. 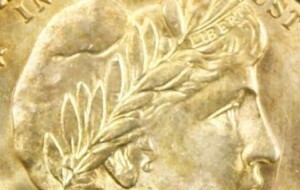 The direction that Lincoln faces on the cent was not mandated—this was simply the choice of the designer. On October 10, 1978, Public Law 95-447 honored Susan B. Anthony on the dollar. 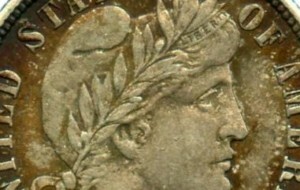 Her likeness on the new dollar represented the first time that a woman, other than a mythical figure, appeared on a circulating coin. The first commemorative coin to feature a woman was the 1893 Columbian Exposition Quarter Dollar portraying Queen Isabella of Spain. The dollar, half-dollar, quarter, and ten-cent coin denominations were originally produced from precious metals (gold and silver). 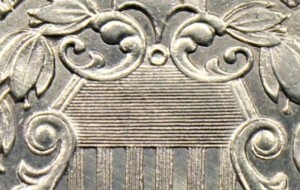 Reeded edges were eventually incorporated into the design of these denominations to deter counterfeiting and the fraudulent use of the coins, such as filing down the edges in an attempt to recover the precious metals. Currently, none of the coins produced for circulation contain precious metals. 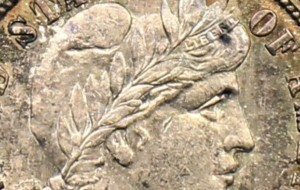 However, the continued use of reeded edges on current circulating coinage of larger denominations is useful to the visually impaired. For example, the ten-cent and one-cent coins are similar in size; the reeding of the ten-cent coin makes it easily identifiable by touch. The 1792 law establishing a national mint directed American money to be made of gold, silver, and copper in denominations of $10, $5, and $2.50 pieces. The dollar, half-dollar, quarter, dime, and half-dime were composed of silver. The cent and half-cent were made of copper. 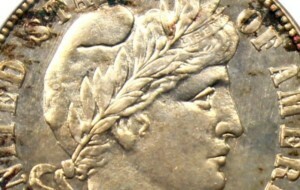 Minting from gold and silver continued well into the 20th century. It was not until 1933, during the Great Depression, that the Mint ceased producing gold coins. 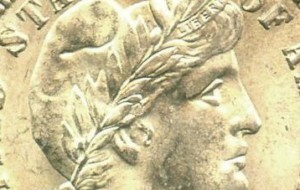 A silver crisis caused the replacement of silver in 1966 in quarters and dimes; however, the half-dollar was composed of 40 percent silver from 1965 to 1970. 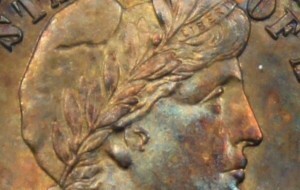 The Bicentennial Kennedy Half Dollar contained 80 percent silver and 20 percent copper. But today these coins are now composed of cupro-nickel clad, with a pure copper core, and an outer layer of a 75 percent copper, 25 percent nickel alloy. Nickels are made from the same 75-25 alloy, and the cent, once a copper coin, is now composed of copper-plated zinc. The cents are less expensive for the Mint to manufacture, and at 2.5 grams each, weight about 20 percent less than cents previously minted of 95 percent copper and 5 percent zinc, which weighed 3.11 grams.